I’m always on the hunt for new ways to make some extra money. If you are reading this – then you probably are too. I want to tell you about something which I’m new too – but I’ve heard really good things about. 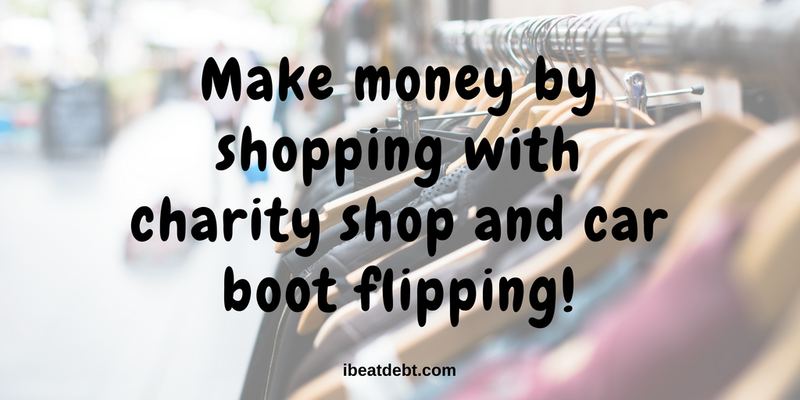 Charity shop (or thrift store) and car boot flipping! It sounds crazy but it really can be a great way to make extra money. I’m not great at it for various reasons – I don’t have a lot of spare time, and I don’t have a lot of disposable income to make purchases in the first place. In a one bedroom flat I don’t have a lot of storage space either. I do however know people who have made some serious money doing this. In short, you research what is selling well on eBay and other reselling sites, and then hit the car boot sales or charity shops. Nowadays, most people have a smart phone, so if you find something, you can have a quick look online for what it is selling for before you commit to buying it. Some people don’t feel comfortable buying from charity shops with the intention to sell the items on. This is something only you can decide on, but in my opinion it is ok. I would never haggle in a charity shop – I always pay the asking price. Therefore, in my opinion, does it matter if I buy the item to sell on, or someone else buys it for themselves? Either way the charity is getting the same amount of money after all. If you are still unsure – you can always donate a percentage of your profits back to the charity – or any of your own unwanted items. I’m really lucky that near where I live and work there are loads of charity shops. I don’t often get time to go in there, but when I do, it is worth a rummage. My favourites are ones near home which are actually clearance stores. I didn’t realise charity shops had clearance stores, but these ones are brilliant. There is always the concern that if the item hasn’t sold in their stores, would it really sell online? 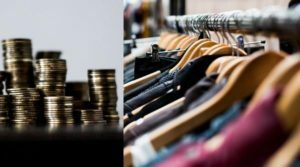 You would need to decide yourselves, however some of the items may not have been on sale for long or at many different stores before ending up in their clearance shop, so they are definitely worth a rummage. One of the clearance stores near me even had a “fill a bag for £5” day which meant that I got insane bargains, so events like this are great to look out for. They did it not because the stuff was stuff that hadn’t sold (although some of it was) but because they had too much stock being donated and so needed to make a bit of space! I have picked up lots of things which are brand new with tags on them. Just because they are new with tags doesn’t guarantee a sale though – so make sure you still do some research. Some other charity shops have clearance rails – look for them too. I got a brand new with tags pair of Craghoppers trousers – sold them on eBay for £10 profit! Near where I work there is a different selection of charity shops. Before I started working there, I didn’t realise that charity shops price the items for the area. Where I live (without sounding arrogant) is a slightly nicer area. The same chain of charity shops has a store near my work – their prices are consistently lower than the branch near my home. It is worth bearing that in mind. There is also a great little charity shop near work which is for a really small charity, one that I had never heard of. Their prices are also really really good in comparison to some of the others. I don’t know if it is because of the profile of the charity but it’s worth shopping around and sussing out the stores before you pick your favourites. This is particularly relevant if there are a lot more shops near you than you would have time to visit. There is no getting away from it, going to car boot sales requires an early start. At car boot sales I would say haggle away, but equally don’t go over the top. At the end of the day, the sellers are there to make some money. If there is something in particular you are interested in (computer games, antiques, clothes etc) do some research before you go. I recommend sticking to things that you are interested in and will enjoy browsing for and researching. It will make it a more enjoyable experience as well as being more likely you will make a profit. I recommend taking lots of plastic bags or shopping bags with you. Now there is a charge for plastic bags, the sellers have a lot less to start with and might be reluctant to part with them. Therefore it will make it harder for you to carry your purchases unless you come prepared. My trusty back pack with a pocket stuffed with bags for life is a life saver. Much as the serious car booters get there super early (I’ve had people looking in the car boot before we’ve even unloaded the car) there is something to be said for going for a drink or snack, and coming back during the last hour or so of the sale. Buyers will be thinking about packing up and heading off. They will have been sat there for anything up to about 6 hours and they will be more likely to take a lower price just to get a quick sale and this is quite often when the real bargains can be snapped up. They will probably want less packing up to do. Also, if they take the items home they then have to store them or find another way to get rid of them. Another reason why you should hang around! Check the items over thoroughly before you buy them. Don’t give in to the hard sell (“Oh it’s really valuable” etc – do your research). Only buy something you are sure about – listen to your gut. Don’t buy something for a price you aren’t happy about. Research postage and shipping costs of the items you are looking at buying before selling them on. This is an easy way to make a loss! If you are regularly buying things to sell on, remember you need to inform HMRC and declare your extra earnings. 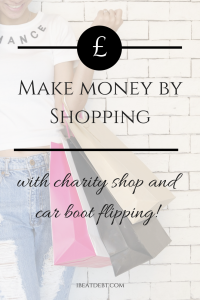 If you decide that flipping is something you want to get involved in, I can recommend blogger Emma Drew’s posts about charity shops and car boot sales. They make some great reading and will give you lots of ideas. Some of my other favourite resources on this are by the Money Crashers and Apartment Therapy. Have a read and let me know if you find any bargains and make some amazing profits! I love car boots sales! You can find everything imaginable at them. Good advice for people who buy to resell. I love them too-just not confident enough to spend money on things that I might not be able to sell on. Maybe if I had more time to research, but currently every minute is spent on this site. I’d like to give the charity shop thing a go, only around here they seem to be so expensive! Tell me about it! Luckily the ones near where I work are a lot cheaper. I used to be a really keen charity shop shopper but I’m guilty of not entering one recently. I used to love rummaging through the rails for bargains. Something I should do again!